The Tank Deck is figuratively and literally the center of the LST. This empty space was filled with any and all manner of vehicles, supplies and equipment. In addition to the basic role of carrying this material to the beach during an invasion, some LST’s had their tank decks converted to floating hospitals, troop barracks, and huge repair shops. The tank deck was located just above the waterline and parallel to it throughout the ship’s length. 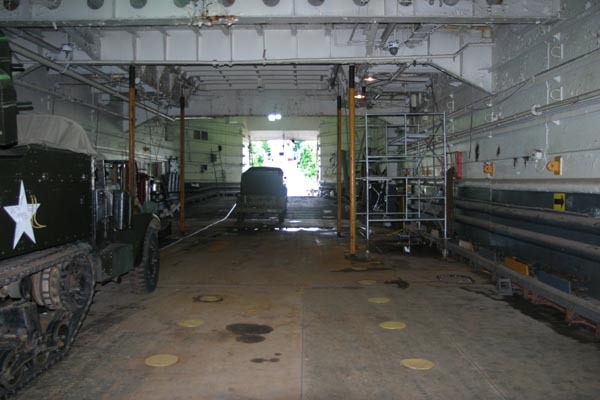 There were sprinkler systems on the tank deck and fire mains on the main deck. 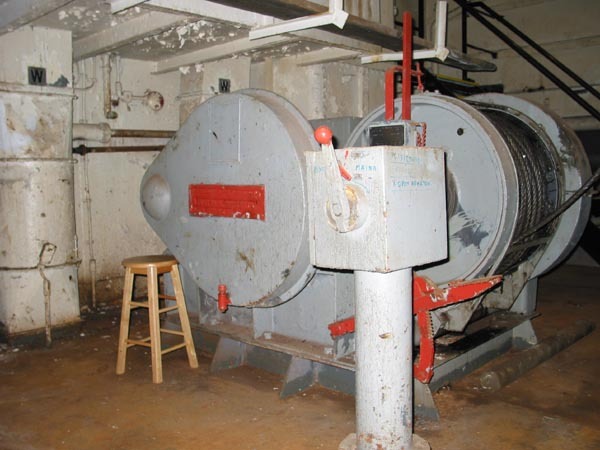 A fan-trunk ventilation system was used to remove exhaust fumes from the tank deck, and served a dual purpose as the air circulation system for the crew’s quarters. On the deck you will again see cloverleafs. They fit specially designed “gripes” or “tiedowns” used to secure whatever vehicles or cargo were carried. A load which broke loose during transit could create a dangerous situation. This picture shows good detail of the after most part of the tank deck. In the upper left hand corner, the hatch going back into the aft crew's quarters is visible. Also on that platform is the Damage Control Locker. At this location, a damage control team would gather during general quarters. After checking in, the team would await orders to repair any battle damage the LST might suffer. There is also a platform in the right hand corner of the picture. From here, one can access a trunk that goes down to the evaporator room. A Greek flag is still visible from the LST 325's many years with the Greek Navy. The third picture, also from the after part of the tank deck, looks forward down the length of the deck. On the left side of the picture timbers are seen stowed on the bulk head. These timbers are likely for damage control purposes, but might be used to secure certain types of cargo on the tank deck. Also visible is a rectifier that converts AC shore power to DC. This was added in order to allow the ship to run its DC electrical systems, while taking on AC power from the shore. This last picture shows the forward aspect of the tank deck with the bow doors open and the ramp lowered. Also visible in the picture is a half track and a truck ready to hit the beach.